There’s nothing better than curling up with a hot cup of tea after a long day. 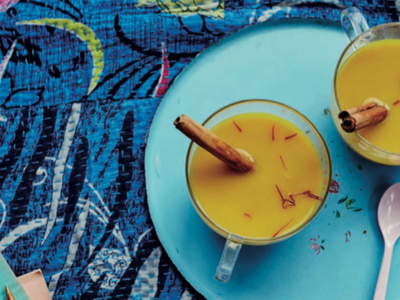 Sit back, relax, and enjoy this soothing Uplifting Spiced Saffron Tea from THE HAPPINESS DIET. As discussed in our Golden Rules, saffron has been used in traditional medicine for generations and has been shown in some studies to help alleviate anxiety and improve mood. This tea has an intense aroma and flavor. We use a rooibos tea bag, which is caffeine-free–chai is a nice alternative, though it does contain caffeine. I find drinking the tea from a favorite cup makes all the difference. As Oscar Wilde said, “I adore simple pleasures. They are the last refuge of the complex. Place the water, cinnamon, cardamom, and cloves in a pan and simmer gently for 5 minutes. Turn off the heat, add the saffron, and leave it to steep for 5–10 minutes or longer if you aren’t in a rush. Then add the milk, tea bag, and turmeric, and heat gently through without boiling for 1–2 minutes, or longer if you want the tea flavors to be stronger. Remove the tea bag, add the maple syrup, and pour the tea into your favorite cup, glass, or mug. You can strain it first, but I prefer to leave the spices in, avoiding the cloves, cinnamon, and cardamom as I drink but enjoying the odd saffron strand. 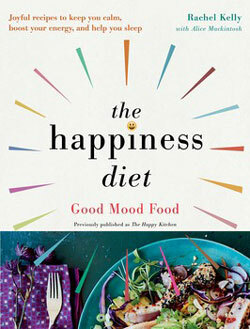 Find more recipes in THE HAPPINESS DIET by Rachel Kelly! Pair your tea with a delicious banana scone. 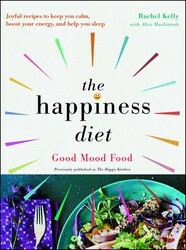 Excerpted from The Happiness Diet by Rachel Kelly. Copyright © 2017 by the author. Used by permission of the publisher. All rights reserved.